When i upload my site. Should i upload "PSD file Photoshop source design" to host ? You dont upload the PSD file, thats just for making alterations to the design using Phototoshop. I have downloaded the Business Website Template and received a ZIP file on my desktop. What do I do next...? 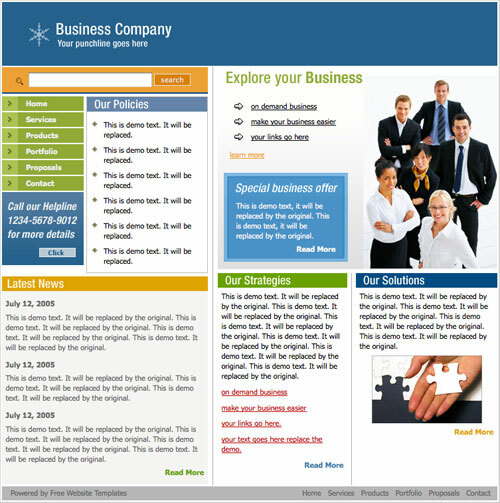 I have downloaded the Business Website Template, saved it my documents. When I open the attachment and click on the internet icon, it opens in Internet Explorer with just some wording, and no design. Thanx a lot 4 da linx! I was able to download the templates and open and run it in Visual Studio 2005. I managed to see some templates from icetemplates.com. They are so cool. Nevertheless, can i embedd those flash file in the html file or aspx file? Please advise. I dont want that my home page is a flash file for fast rendering reasons. Although i really wanted to put some flash into my website. Thanks you in advance. By the way, do you have any feedback on icetemplates.com com? I'm thinking of buying some templates from them. You should use a web editor to create similar pages. Although you have templates, it is important to have a kowledge of html to edit and create additional pages. Recently I purchased a template from them when I did not recieve my item and was ripped off. They of course do not have a customer service number only customer service tickets that they do not answer. I tried numerous times to get in touch with them when I got nothing. Please do not make the same mistake I did and loose your money!! By the way, do you have any feedback on icetemplates.com com? I'm thinking of buying some templates from them. I've bought templates from icetemplates.com several times. And I got fully satisfied with them. Though at first purchase there was a delay with verification, next time I bought everything was OK.
you must unzip the file. Open the folder up(If they are not in one make one and put them in there) then select extract all files. I liked the clear structure of this template especially three columns like Latest News, Our Strategies and Our Solutions. They look like three steps one should follow to get the main idea of the company. As far as I understand you prefer to place the same links in Our Strategies block and under Explore your Business signature. Know what? I think it would be better not to overwhelm the picture with any additional information. 2. Double click on the index.html file. 4. Play around with it just as you would any Word or Excel document. Save your customized changes. Then upload it to your web server. Ok I duplicated the page in Frontpage and was able to edit the text ok but how do I adjust the columns? When I go to page or paragraph formating I have had no luck. Any ideas? I'm obviously doing something wrong. I've downloaded successfully, however, I'm unable to open any of the zipped docs. The .psd says it's an unknown file type. Am I missing software on my computer to open your docs?